It's time again for a bumpdate and it couldn't come at a better time because I am for sure bumpin now! There is no hiding it now! Cravings : Nothing new really...Wendy's always sounds good but I still haven't had any 'omg I have to have ____ right this minute.' I feel like it might be coming though. On the plus side, we have discovered that McDonalds soft serve ice cream cones do not seem to make me sick so we've had quite a few of those. Aversions : This is way better! I even had coffee last weekend! Nothing has been off limits lately. Maternity clothes : I finally wore maternity shorts over the weekend and I am not sure what took me so long because they are glorious. I also wore these pants to work this week and they are SO comfortable. It's going to be hard to not wear maternity clothes all the time after this baby comes. Overall dresses and skirts are my best friends and are the easiest to work with. Thank goodness it's summer. Best thing so far : FINALLY finding out the gender. We have had so many fun conversations talking about Little Mister. Looking forward to : Feeling some major kicks! Work outs : Still consistent with these! I ran/walked earlier this week since it was cooler and have been making it to the gym as often as possible. Sleep : Still going well! I definitely have to get up to go to the bathroom more often but usually just once a night. Movement : I think I felt some little kicks this past week....! And that's where we are right now! You are looking so adorable, Sarah!!! :) Isn't feeling movements THE best thing in the entire world?! Just wait until you feels the big kicks and rolls and stuff... I never got tired of them and I seriously miss them now! I can't wait to see what you guys do with the nursery- I know it's going to be awesome! How exciting! I could totally go for McDonald's soft serve now...yum! 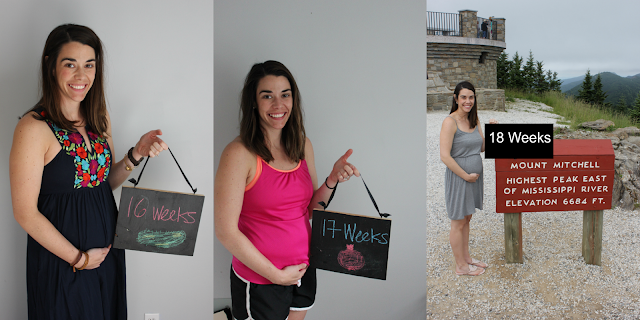 I love that black embroidered dress you're wearing in the 16 weeks picture! Awe you bump is getting so cute. I remember this time. So much fun. Thanks for following along with me. I can't wait to start following you! Have a great weekend!